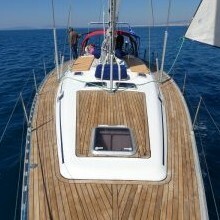 Skipper - Join the SailTime Charters team in Greece! Wouldn't you rather be sailing on the same well maintained 51 feet sailboat all season, have the comfort of your own cabin/head and a steady employment instead of having to search for a temporary 7 day job on different charter sailboats each week? Did you train to work as a professional skipper so you could enjoy the sea, the islands, meting people and showing them the beauty of Greece or did you do all that hard work so you have put up with the uncertainty of "Am I going to work next week? For which company? On what boat? Hopefully somebody will offer me something.."
At SailTime charters we struggle to over the best environment for the skipper and a great experience for the guests. We bend over backwards (and maybe do some flips) to make sure they're happy. We don't ignore their suggestions or requests-we love hearing them as it help us learn, adapt and become better. We'll be honest. SailTime Charters isn't for everybody. If you hate adapting or if spending hours with customers and brainstorming to find the options that suits them best annoys you, then we're probably not for you. But if you are an enthusiast skipper and you'd like to use your people skills and happy to go the extra mile to make your passengers happy ( and not for convincing a different charter company to use your services next week) then you need to apply. Our company core values: high customer service, safety, flexibility and professionalism. - taking care of the vessel itself with all routine maintenance and checks, etc. Salary range : 1050 - 1190 euro per week ; bonus for excellent performers.